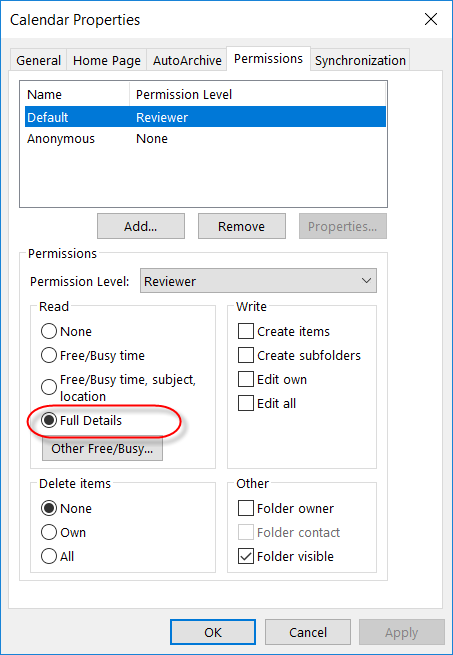 Outlook Calendar Print requires Full Details permission on each calendar it try open, to get automatically selection to work. Follow the instructions below to share your calendar or add, remove, or review the calendar permissions you have delegated. Select the calendar that you would like to share, right-click on your Calendar and choose Share, then Calendar Permissions. On the Permissions tab, you may add or remove users whom you have delegated access to your calendar. To add a new delegate, select Add… and search for the desired user by Last Name. You can search the Global Address List, or your personal contacts list by selecting the appropraite drop down under Address Book. Under the Permissions heading choose the level of detail you would like to provide the user. To remove a delegate, select the user and choose Remove.